NEW YORK – Dec. 11, 2012 – Developer PlayPlus today announced the launch of Canimals Match 3, a new, fast-paced game based on the Canimals characters from VOOZCLUB. 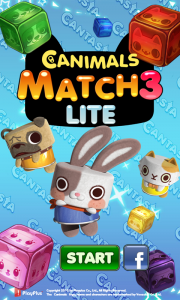 Canimals Match 3 debuts as an offshoot of Cantasia, a kid-friendly social gaming hub that recently launched on Facebook. The launch of Canimals Match 3 marks the first mobile mini-game release from the Cantasia platform. The game is available for download exclusively on Samsung Apps, and will be coming to Google Play in January. Download Canimals Match 3 at the following link: http://www.samsungapps.com/mars/topApps/topAppsDetail.as?productId=000000516372. Canimals Match 3 is a simple yet addicting puzzle game, where gamers work to attain the highest score possible by combing three or more same-color blocks in a row. 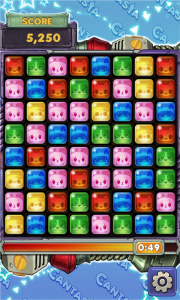 Players can pick either the standard arcade mode or tilted mode, where the colored blocks are less numerous and shifted sideways, for a new type of gameplay. Gamers earn coins for each completed match, which they can spend on game boosters, like the speed booster or time booster. By signing-in with Facebook, friends can battle one another in a tournament mode, as well as pit themselves against others from around the world. Canimals Match 3 also links with the match 3 mini-game from Cantasia, so players can play on the go while still improving their Cantasia City. VOOZCLUB has previously released 18 apps around the world, including Talking Oz, which hit #1 in the US App Store in the entertainment category and received hundreds of thousands of downloads on Google Play. Experience the fast-paced fun of Canimals Match 3 today at the following link – http://www.samsungapps.com/mars/topApps/topAppsDetail.as?productId=000000516372. PlayPlus, founded in 2010, is a leading online game developer and publisher and creates online social games and mobile games. For social games, the company has created Soul Crash©, a unique battle-action RPG, and Cantasia©. PlayPlus also developed games for mobile, including Canimals Dozer, TD and, Cantasia. VOOZCLUB Co., Ltd. is an independent character development company that creates and manages characters in markets worldwide. In 2009, with the creation of Canimals, VOOZCLUB started expanding into Asia-Pacific and Europe across a variety of merchandising and multi-media platforms.